Hopefully, yesterday wasn’t too much of a fiasco for you and you navigated your way through the stormy waters of the 5 cups along with Pluto squaring Venus. Today however, is a totally different story and one that goes to show just how quickly things can change with the transiting planets along with a fresh tarotscope. The 2 of cups is a card of love. In this version of the card a man is seen sitting sage like on a bench made of uneven rocks whilst he pays homage to the sun (or is that a full moon?). It is difficult to decipher whether this is dusk or dawn due to the gorgeous shade of blue in the sky and as we all know even a full moon can be seen in the broad light of day. Is he trying to balance his emotions or is he trying to bring a relationship back into emotional stability through his own efforts. Whichever way this plays out today it will not be boring or lonesome. 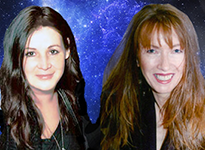 The energy of Uranus conjunct Venus is quick, fast, erratic and usually totally unexpected and just to clarify… this will be to do with your love life! Sounds too good to be true doesn’t it. If you’ve been having difficulties within a relationship today may just brush those difficulties aside however don’t go pushing too hard because with Uranus anything can happen… and probably will! If you are single and looking for love today is a day where it may just land in your lap from out of nowhere. Depending on how you are feeling today take a look at the bright circle in the pale blue sky and decide whether this relates to the sun or moon for you. Imagine yourself as the figure on the stone platform playing homage to the circle in the sky (keep in mind whether this a sun or moon for you) and lose yourself within its orb. As you do so you may like to make a wish related to your love life because today miracles are possible. Whilst your focus is lost within the orb (sun/moon) move your eyes over to the right hand side of the card and look within the bamboo shoots. There is a figure within the bamboo, cunningly hidden and waiting to be discovered. I’ll leave the discovery and what the meaning is for you. Perhaps you’d like to share your thoughts with us… we’d love to hear from you. 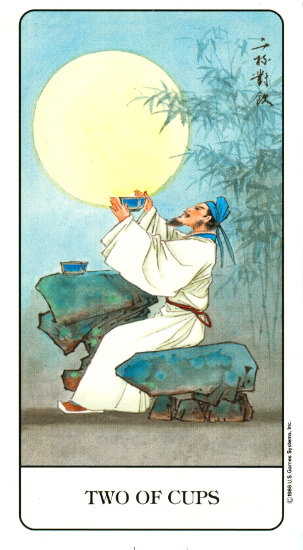 The card used for today’s tarotscope is part of the Chinese Tarot by Jui Guoliang and U.S. Games founder Stuart R. Kaplan, published by US Games.